Halloween is creeping around the corner with September already here. It’s time to start planning your big Spooktacular Halloween Party along with what kind of costume you’ll be wearing to celebrate. 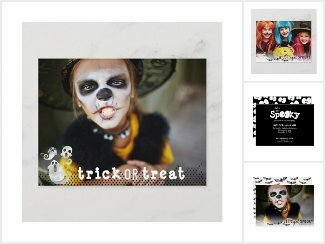 Each of our Halloween Party Invitations come with matching accessories like stickers, photo greeting cards, table runners, pillows, gift tags, drink labels, leggings (yes, leggings! ), and so much more. What option will you choose to invite each ghost and ghoul to the spooky party?